Don't miss out on our annual Chill Dip! This year our annual Winter Celebration will be taking place from the 27-29 July 2018 and we are already getting stoked with all the exciting events and activities that will be on offer. This year our theme is "Let it snow" and we are hoping that the weather will also come to the party we have planned!! 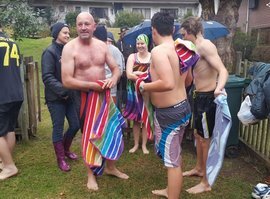 With crafters galore, the annual ‘Chill Dip’ to thrill and so much more, this years event is not to be missed! Craft stalls at the various venues. Hiku hikes- discover your poetic self in the forest. Children’s Activities – Candle Dipping, Story Telling, tight rope walking, archery. Plan your Hogsback visit now to enjoy our HOGSBACK WINTER CELEBRATION! Accommodation is always at a premium, so book your stay now! A provisional programme will be published on this site as soon as it becomes available for you to download.